Rajas Enterprises (India), is one of the renowned company, engaged in providing innovative Medical/ Surgical/ Dental/ Eye/ ENT/Physiotherapy/ Medical Education and Rehabilitation equipment to the health-care industry. Since inception in the year 1990, we have been continuously manufacturing and exporting our high performing & precision equipment around the globe. 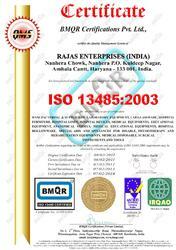 Product development at Rajas Enterprises (India) is one continuous & ever evolving process. We through our proper R&D, keep on designing & producing new products that are functionally superior & yet cost effective in nature. The driving force behind the formulation of our premium quality product range is the never dying quest to serve the health industry with perfection & professionalism. 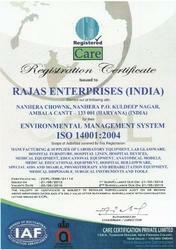 Being An ISO 9001 and 14001 certified company. We believe & function with the principle that the growth of a company is directly proportionate with the quality they produce. We have adopted stringent quality control measures to ensure that we strike the perfect "balance" between the quality we produce and the costing of our products. Our quality control managers test quality at each stage of pre-production, production and supply & only further those products to the client that are in accordance with the quality parameters accepted by international market. On our path to success, we constantly keep reminding ourselves about our mission & never loose sight of it. 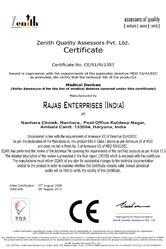 To emerge as the most dependable exporter of medical equipment worldwide. To improve the quality of human life, by delivering efficient & innovative product range in a cost-effective manner. To strive hard to exceed the expectations of our esteemed clients, each time and every time, with strong will and volition. To work diligently, binding to our 'value system' with highest ethical standards, and be a renowned and valued company in our field of functioning. We take pride in spreading our products across the globe and our highly efficient Medical/ Surgical/ Dental/ Eye/ ENT/ Physiotherapy/ Medical Education and Rehabilitation equipments have been well accepted by the clients all over. This has been one of the major reasons behind our success in more than 25 countries by now. With our commitment of producing innovative product range, we have been able to garner repeated orders from our customers. This whole procedure has helped us in adding new names to our clients'' list and in also retaining the previous ones at the same time. We are committed towards meeting National & International Standards of manufacturing and supplying quality Product. We are committed towards meeting clients' expectations, each time & every time. We evaluate results of our management processes, work methods, practices, controls and resources on a consistent basis in order to achieve continual improvement of our systems, products and services. We accept responsibilities that are associated with the health industry & try our level best to work professionally towards the betterment of society.